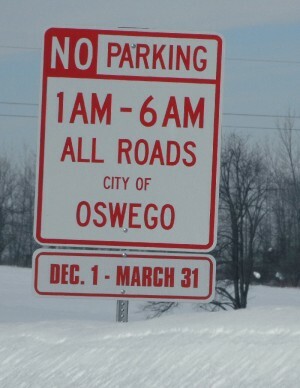 OSWEGO, NY – The Port City’s DPW is trying to keep up with the lake effect snow as best they can. 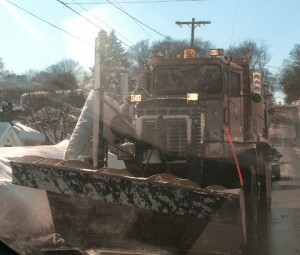 Snowplows have been a common sight on the roads the past several days. As of 4:15 p.m. today, Mayor Randy Bateman has lifted the Winter Parking Advisory. The mayor said he thanks all motorists who didn’t park on the city streets during the winter parking advisory so city resources could clear the streets. 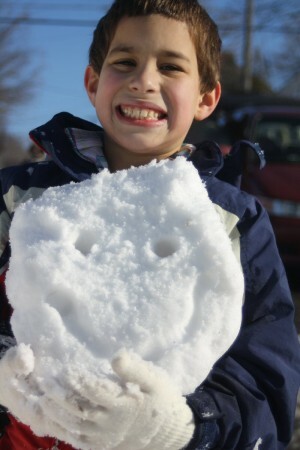 At the Leighton School hill, Robert Fisher Clark, 9, of Oswego, shows off his snow smiley - a thank you to the the doctors, nurses and other staff that made his stay at Golisano Children's Hospital a pleasant one. The youngster recently had his appendix removed and is recovering at home. They treated him like a king, his mother said. If it is at all possible, Mayor Bateman is asking residents to still continue not to park on city streets. “It makes it easier for the Department of Works to clear our streets, especially the smaller ones, for emergency vehicles,” he explained. Smith said the plows were focusing on the areas that needed the most attention, making sure the main roads and emergency routes were cleared. “The houses and trees look as though they are peeking out from underneath a fluffy white blanket. What a treat for the eyes, as long as I don’t have to drive in it, ” said Michele Southgate, of Lakeside Artisans. The group plans to open an Artisans’ Co-Op at 193 W. First St., in Canal Commons in March. Other areas of the county have experienced even greater accumulations. Due to exceptionally difficult winter weather, Thursday’s scheduled meetings of the county’s Finance and Personnel Committee and the County Legislature have been rescheduled for Friday at 1:50 p.m. and 2 p.m., respectively, according to Ted Jerrett, county clerk. 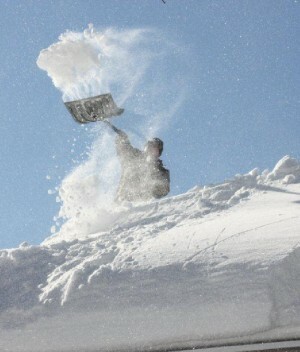 Jack Hackett of Fulton shoveling snow off barn roof in Hannibal. The snow was above his waist on the roof and heavy!! Jack says this snow on roof ranks right up there as far the worst he has ever seen! The first batch of snow came through between 1 and 7 a.m. dumping 6 inches on the Port City. That’s pushed the monthly total to 33.6 inches. A typical February receives 34.5 inches. Amy Dittly cleans the snow off her vehicle's windshield before she heads home after work on Thursday. For the winter, Oswego’s snow total has now eclipsed its average. 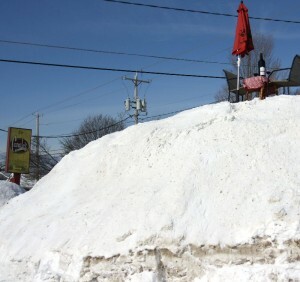 The winter of 2010 – 11 now stands at 153.3 inches; a normal winter is 150.8 inches of snow. While the city of Fulton didn’t get as much earlier today, it’s received its share. As of Thursday morning, Fulton had 28.6 inches of snow for the month and 188.7 inches for the winter, according to John Florek, Fulton’s weather watcher. It could be worse, he noted. 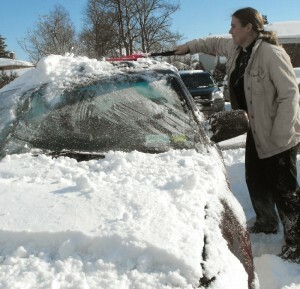 As of Feb. 9, 2004, the total was 233.0 inches – en route to the second snowiest winter season in Fulton (272.5 inches). That was less than 3 inches away from the snowiest winter in Fulton (275.0 in 1995-96). The average snowfall for a Fulton Winter is 178.3 inches. “The snowiest February for Oswego was just recently, 95.9 inches in 2007,” Gregway said. While most other Februarys have been rather moderate a few caught Gregway’s eye as he was checking his record book. 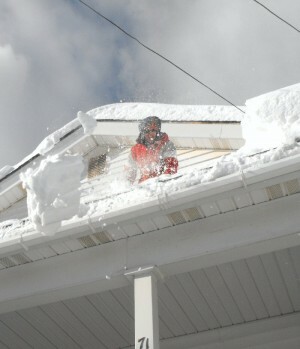 Will Taylor heaves some more snow off the roof of his west side Oswego residence Thursday. The snow had piled up to more than four feet deep. A sign of the times in Oswego. I have been enjoying the winter snow report on Oswego while I am down in North Carolina for the winter. However I cant help remebering the winter of 1958-59 when we had a snow storm on Dec. 7th and when I got up the next morning I couldn’t get out the door as 50 inches of snow had fallen in 24 hrs. i had to go out a window and clear the snow in front of the door. The roads wern’t plowed and I think Mayor Corsall toured the City on a dog sled that someone from Central Square brought in. Now thats some snow fall.